Coming Home (Gui Lai, 2014) is Zhang Yimou’s wistful reflection on love, memory, and the futility of bemoaning a tragic past. In this case the tragic past concerns the period from the late 1950s to the late 1970s during which the Chinese people were subjected to brutal oppression in connection with such Maoist-led campaigns as the Anti-Rightist Movement, the Great Leap Forward, and the Cultural Revolution . Although the famous “scar literature” subsequently emerged that sought to expose wrongdoings of this period , it has always been difficult to discuss such matters inside China itself, due to government suppression of these topics. Nevertheless, Zhang Yimou has been able to make some dramas that have been set during these turbulent times by skirting overt political polemics and focusing instead on universal personal values. This was also the case with Coming Home. The story of Coming Home is loosely based on the novel The Criminal Lu Yanshi (2011) by well-known Chinese authoress Yan Geling, whose novella The 13 Flowers of Nanjing (Jinlíng Shísan Chai, 2011) had earlier been adapted by Zhang Yimou for his film The Flowers of War (2011). Yan Geling’s novel The Criminal Lu Yanshi tells how the title character, a professor who dared to express his views, was extensively persecuted and forced to work in a prison work camp during the Anti-Rightist Movement and the subsequent Cultural Revolution. Zhang Yimou’s film adaptation skips over all of those devastating elements and only covers the period at the end of the novel, when the main character is finally rehabilitated in 1979 and returns after a twenty-year absence to a broken family that doesn’t even recognize him . The film was criticized in some quarters for avoiding the presentation of controversial material about the Maoist dictatorship in order to please the Chinese authorities. But Zhang may not have had much choice if he wanted to have a film produced and distributed in the country. 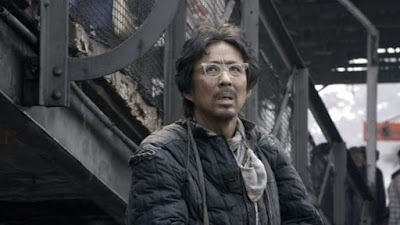 In any case, I would say Zhang’s concentration on the period’s pervasive climate of fear and its devastating long-term effects (which are associated with the latter part of the novel) probably wound up being more subtle and powerful than any obvious depiction of tyrannical prison-camp brutality associated with earlier parts of Yan Geling’s tale . A film about love and memory, and focusing almost exclusively on a middle-aged couple, needs strong but subtle acting performances, and Zhang chose two stellar performers for these roles – Chen Daoming and Gong Li. Chen Daoming is a well-known Chinese film and TV actor, who had earlier appeared in Zhang’s epic Hero (2002). Gong Li, of course, had been closely associated with Zhang Yimou’s early rise, starring in such films as Red Sorghum (1989), Ju Dou (1990), Raise the Red Lantern (1991), The Story of Qiu Ju (1992), To Live (1994), and Shanghai Triad (1995). But after that earlier close relationship, she had only appeared in one subsequent Zhang Yimou film, Curse of the Golden Flower (2006). Here in Coming Home she appears as an unglamorous middle-aged woman, but she still retains her magnetic appeal. A third important role was that of the couple’s daughter, which was well played by newcomer Zhang Huiwen. Her ballet-dancing background was undoubtedly a crucial qualification for the role, since her character is (like Yan Geling was, herself) a Cultural Revolution Red Guard dancer; but her acting performance in other respects is excellent, too. The film’s mood and pacing is slow and somber, almost dirge-like, and it benefits from Zhang Yimou’s customary superb cinematography (he started out his career as a cinematographer). Although in earlier films his cinematic expression is often full of vivid coloring, here everything is muted and grey – almost oppressively so. And this sustains the mood of melancholy. This moody atmosphere is complemented by the contemplative piano music score of Chinese composer Chen Qigang. There is one aspect of Zhang Yimou’s mise-en-scene in this film that I found surprising, though, and that was the relatively high number of jump cuts in the visual editing. Normally when an editorial cut-on-action appears in a film, it has been motivated by the action in the story. For example we see someone dropping something on the floor, and the next shot shows a downward-looking view of what was dropped. The viewer doesn’t notice the visual discontinuity of the images, because the narrative flow motivates a desire to see the next perspective. A “jump cut” refers to an editorial cut-on-action where the two successive shots are from more or less the same angle (the same camera axis) and the image size has not changed significantly. So the cut was not motivated by the action and stands out to the viewer as a discontinuity. Hence we feel that the image “jumped”. Sometimes jump cuts are intentionally inserted into a film sequence, such as in Jean-Luc Godard’s Breathless (1960), in order to create a psychological effect of hectic discontinuity. And indeed Zhang Yimou has, himself, sometimes used jump cuts in the past to create a emotional montage effect, such as in The Road Home (1999) when Zhao Di is hastily preparing a dinner for the new teacher, Luo Changyu. But that kind of intention does not appear to be the story here in Coming Home. Instead there are a number of unmotivated jump cuts, from closeup to medium shot for example, that are only distracting. But never mind; the film’s virtues outweigh any such minor imperfections. Coming Home’s story moves through four main phases. The time is around 1969, and dissident intellectual Lu Yanshi (played by Chen Daoming), imprisoned in a remote labor camp for unspecified reasons during the Anti-Rightist Movement (1957-59), has just escaped from custody and made his way back to his home city in northern China. He desperately wants to see his wife Feng Wanyu (Gong Li) and young teenage daughter Dandan (Zhang Huiwen), whom he hasn’t seen for ten years, but he knows the authorities will be waiting for him. The police fiercely warn Wanyu and Dandan not to collaborate with the criminal, and cast an aura of intimidation over the family. Right away Zhang Yimou sets up a triangular separation for the three characters. Wanyu and Lu are desperate to reunite, but Dandan, who hasn’t seen her father since she was three and who has been indoctrinated by then raging Cultural Revolution dogma, rejects her father as a traitor. She is now a Red Guard ballet dancer seeking a lead role in an official production of the doctrinaire Red Detachment of Women ballet. Lu manages to get a message to Wanyu to meet him at the train station so that they can runaway together, but the selfish Dandan wants to thwart the idea. In an excellently choreographed sequence of ensuing triangular separation (Lu - Wanyu - Dandan/police) at the station, the couple try to escape. But Dandan betrays them, and Lu is recaptured, while Wanyu is beaten and suffers a head injury. The action now shifts forward ten years to 1979. Mao Zedong has passed away, the Cultural Revolution has been revoked, and leader Deng Xiaoping (who was once an enthusiastic supporter of the Anti-Rightist Movement) has approved the exoneration of thousands of past “Rightists”. Lu Yanshi, now rehabilitated, returns home, but finds his family in ruins. On Lu’s return, Wanyu is cordial on seeing her husband but doesn’t seem to recognize him. Lu soon learns that she is suffering from psychogenic amnesia, a form of selective amnesia that can be caused by a traumatic event – in this case it was the tragic recapture of Lu at the train station ten years earlier. But we will later learn that there was another distressing episode that traumatized Wanyu. In a frantic effort back then to save her husband’s life, she seems to have compromised her virtue with a Party official, Mr. Wang. That infidelity is another horrible memory that must be obliterated. In addition, Wanyu has cast Dandan out of her house and is barely on speaking terms with her daughter, who has given up her ballet aspirations and now works in a dingy factory. Dandan’s banishment was because of her betrayal of her father and her subsequent destruction of every existing photograph of Lu from the family’s photo albums (which may have contributed to Wanyu’s forgetting what her husband looked like). In other respects Wanyu appears to be normal, and she still works as a schoolteacher. And she still passionately loves her husband; she just doesn’t think the real Lu Yanshi that has now approached her is actually that husband that she loves. Lu still loves his wife, too, and he is certain their old passion can be recovered if he can just get her to recognize him. In some ways this is reminiscent of the situation depicted in Random Harvest (1942). So Lu sets about trying successive ploys in an effort to get his wife to recognize him. Since Wanyu thinks her husband is still away at the prison labor camp, Lu sends her a letter as if from there to announce that he will be arriving by train on the 5th of the month. She eagerly goes to the station to meet him, but she fails to recognize him as he emerges from the train. Since Lu was a good piano player and Wanyu still has his old piano in their home, he presents himself to Wanyu as a piano tuner. After tuning the piano, he sits down and plays one of the pieces that he used to play for her. This piano music, by the way, matches the melancholy soundtrack score that has served as a moody backdrop throughout the film. Wanyu is touched by the music and for a moment seems to recognize him. They embrace momentarily, but then she rejects the suddenly strange man who is touching her. Lu manages to collect all the old letters that he had written to her while in prison but that were never delivered, and he has them posted to her in a box. Then he poses as a kindly neighbor who is willing to read the letters to her. Although Wanyu delights in listening to the letters read to her, she never makes the connection that the very man reading the letters is her longed-for beloved. Lu is getting despondent about all his vain efforts, but he decides to accept reality and see if he can somehow make the existing situation a little better. So he starts inserting some freshly composed letters into the collected letter box. These new letters, which Wanyu accepts as authentic messages from her dear husband, contain advice for her. He urges her to reconcile with the now-repentant and more empathetic Dandan, and Wanyu does so. Dandan, in turn, decides to return to her ballet dancing. In the final movement of this sad composition, Yu finally learns about his wife and Mr. Fang. At first Lu seeks revenge, but eventually learns that Mr. Fang is just another pawn that has been victimized in a heartless system. He decides in the end to make the best of the existing circumstances and look after his damaged beloved in whatever way he can. 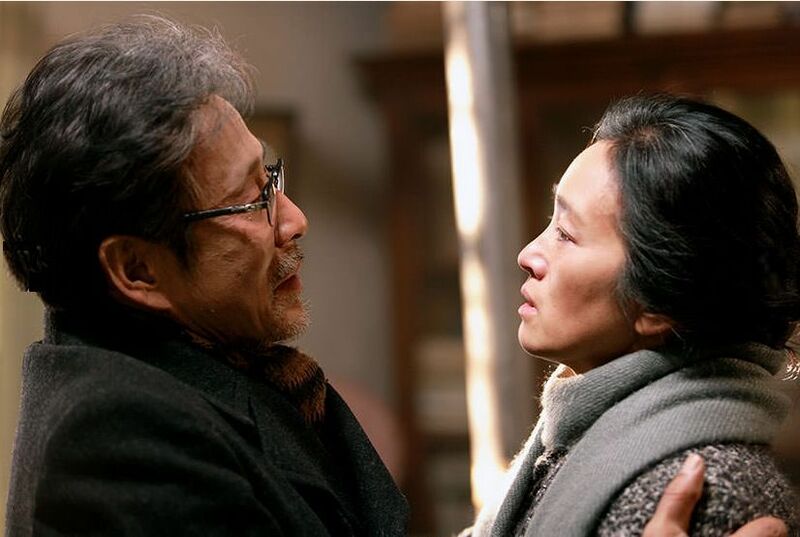 Zhang Yimou’s dramatic meditation on love and memory in Coming Home is deeper and has a wider scope than a political polemic would have had. The tragic circumstances that oppressive social forces can impose on people have consequences that can expose universal aspects of human existence. They remind us of the fundamental nature of human relationships. This film offers us a metaphor about love and the memories that are such an important part of it. Essentially, our relationships with people are based on the narratives we have of them stored in our memories. Sometimes over the course of a long relationship we hold onto the old narratives we have of people and overlook the here-and-now personage. We fail to engage with the person sitting before us and instead imagine a past image from a remembered story. I think men are more likely to do this than women. They cherish the pretty young girl in their memories and overlook the here-and-now partner they are living with. It is interesting that Yan Geling, a woman author who usually writes from the feminine perspective, has reversed the more customary gender roles in this story. It is the man who is the here-and-now neglected partner in this story. Like the principals in Random Harvest, Lu Yanshi is trying to recover the hallowed memory of a lost love. But the outcome and reconciliation are different on this occasion, and perhaps this time they offer the kind of compassionate advice to all of us that can lead to our personal and collective salvation. Seek not revenge, and love the one you’re with. Jung Chang and Jon Halliday, Mao: The Unknown Story, Random House (2005). “Scar literature”, Wikipedia” (27 February 2016). Yan Geling and Olivia Geng, “Writing China: Yan Geling, ‘The Criminal Lu Yanshi’”, China Real Time Report, The Wall Street Journal, (7 July 2014). 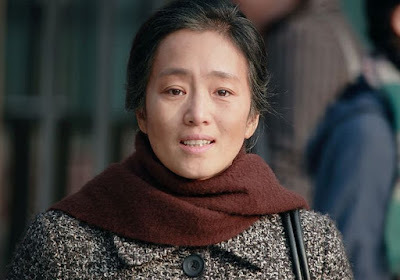 Maggie Lee, “Cannes Film Review: ‘Coming Home’“, Variety, (21 May 2014).